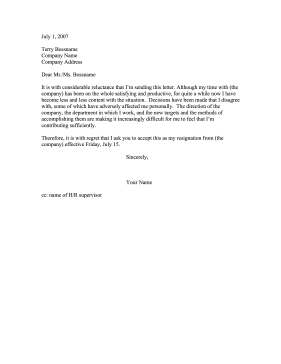 Citing unacceptable circumstances, a bad work environment, and ethical conflict, this resignation letter is for an unhappy employee. It is with considerable reluctance that I'm sending this letter. Although my time with (the company) has been on the whole satisfying and productive, for quite a while now I have become less and less content with the situation. Decisions have been made that I disagree with, some of which have adversely affected me personally. The direction of the company, the department in which I work, and the new targets and the methods of accomplishing them are making it increasingly difficult for me to feel that I'm contributing sufficiently. Therefore, it is with regret that I ask you to accept this as my resignation from (the company) effective Friday, July 15.